Often when I'm considering what topics to write about in this column, the choices range from slightly depressing to total bummer. We have a lot of work to do in the food movement to right some longstanding wrongs. As a result, I normally choose topics that could benefit simply from increased awareness, such as farmworker rights or overfishing of sensitive ocean environments or animal welfare problems. So imagine my delight when, walking my neighborhood in Santa Cruz, CA, I realized a major success story is blooming right under my nose: there are kitchen gardens and mini-farms everywhere these days! This is with good reason. Due to the unprecedented drought in California, for example, municipalities throughout the state are paying people to pull out ubiquitous, water-hungry lawns. What replaces them? In ever-greater numbers, raised beds for growing vegetables (nourished by drip irrigation or graywater, of course). In fact, I hear that even in certain neighborhoods of Los Angeles, you'll see raised beds in front yards more often than you'll see lawns. Restaurants are getting into the game, too, and not just in California. Tupelo Honey Café in Asheville, NC, was so committed to the idea of growing their own food that they opened their own 10-acre farm, Sunspot Organics. ABC Kitchen in Manhattan grows some of its vegetables and herbs 10 stories above the restaurant on its building's roof. At our company, we've seen the benefits of this firsthand. 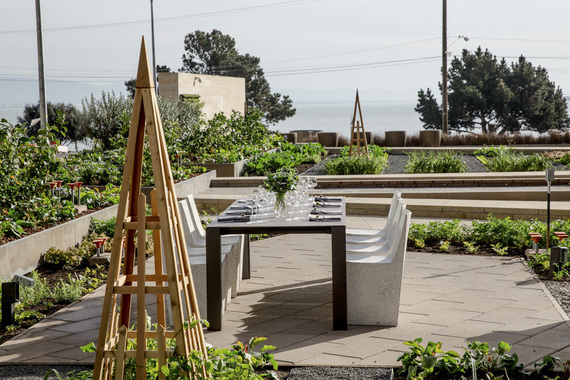 Take STEM Kitchen & Garden, located in San Francisco's Mission Bay neighborhood, a former industrial district on the shores of San Francisco Bay. We're using its sunny location and spacious, wind-sheltered courtyard with panoramic Bay views to grow beautiful produce. The garden (pictured above) provides both an attractive backdrop for diners and the freshest ingredients for seasonal dishes and specialty cocktails. And at the Garden at AT&T Park (home of the San Francisco Giants), we created a 4,320-square-foot mini-farm directly behind center field on top of what used to be bare concrete. Its blueberries, strawberries, avocados, tomatoes, peppers, squash, lettuces, lemons, kale and more -- grown in raised beds and hydroponic towers -- go straight into the smoothies, salads, and flatbread pizzas served steps away to fans. Think a ballpark is an unusual place to grow food? How about atop a convention center? One of the nation's busiest convention centers, Chicago's McCormick Place, boasts a garden, too. All of this represents a sea change in our collective thinking about where vegetables grow, and it's to be celebrated. As we place a greater premium on fresh, locally grown food, entrepreneurs and even corporate wellness teams are also starting to look around their environments and identify places where fresh food can be grown and harvested. Take BrightFarms, which started in New York as a nonprofit, creating the Science Barge, essentially a farm on a barge, anchored in the Hudson River. This led to the creation of a for-profit greenhouse consultancy and soon, BrightFarms was placing greenhouses on the rooftops of places like The Manhattan School for Children and Forest Houses, an affordable housing project in the Bronx. Now, BrightFarms signs supermarkets into long-term produce purchasing agreements, ensuring one of the shortest supply chains in the country -- it only has to travel from greenhouses on the roof of the supermarket downstairs to the shelves! Then there are companies like Freight Farms, whose motto is "Grow Food Anywhere." They've solved the "anywhere" part of the equation through the Leafy Green Machine, "a complete farm-to-table system outfitted with vertical hydroponics, LED lighting, and intuitive climate controls" -- all inside a freight container. There are several of these at Google's headquarters in Mountain View, CA, supplying fun data to crunch about growing food as well as providing our chefs with fresh produce. And at Plantronics, a solar-powered, hydroponic, on-site micro-farm (pictured above, it's created and maintained by Cityblooms) is generating vegetables 200 yards away from our café via the use of automated mini-greenhouses (which they call "growbots"). 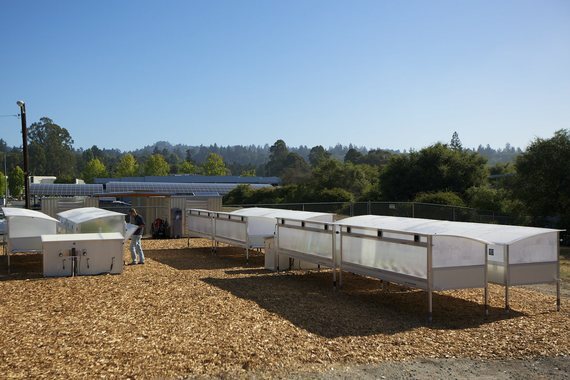 Others are low-tech, such as the 12 raised beds and beehives that delight SAP employees in Palo Alto, CA. From window boxes to fancy hydroponic towers, all of these efforts brighten the surrounding spaces, engage employees in hands-on food education, and yield ingredients grown just yards from the campus café. They're a natural element of any sustainability and wellness program and have become a sought-after perk at work. In fact, corporate campus farms have proved so popular that we created online resources specifically for corporate employees chartered with planning, planting, and tending corporate gardens -- or those who're just considering it. These range from tips for locating land and managing a food garden to short case studies that illustrate the many ways to grow food on corporate campuses. It's not often that those of us in the food movement can sit back and feel that we're making strides, but I am cautiously optimistic that this bounty of farms shows that we can. In trying to improve the supply chain at the same time as we've endeavored to change the quality of our food supply, people are beginning to discover the joys of locally available, seasonally grown, and deliciously flavored produce. Businesses see the value in shortening the supply chain to "just downstairs." Communities appreciate the opportunity that farms in unlikely locales offer area youth to learn about where food comes from. And diners crave the unique flavor and taste of produce harvested only hours before making its way to their plates. It's a fantastic example of something I'd love to see more of when it comes to our food system: progress.